Autodesk Certification allows people who use Autodesk products to validate their skills and knowledge with a credential recognized worldwide. Autodesk Certification allows people who use our products to validate their skills and knowledge with a credential recognized worldwide. 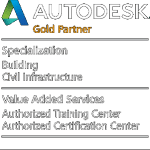 As you have completed your training, the only thing between you and all the benefits of Autodesk Certification is the exam, which you can take at our Autodesk Authorized Certification Center. Click here to learn more about the exam and the support available to you. Autodesk Certification allows people who use our products to validate their skills and knowledge with a credential recognized worldwide.